naijablog: Rubens, in his element..
Rubens, in his element.., originally uploaded by nobodaddy69. 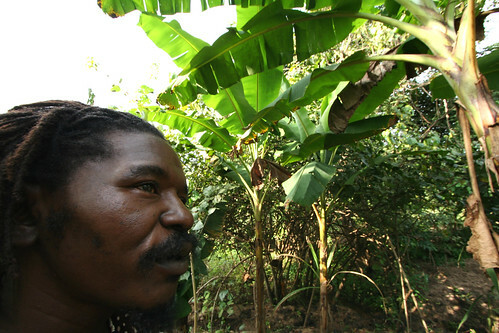 This afternoon, we went to visit Rubens, a man who has planted thousands of trees around Africa. He currently lives in a small paradise close to Abuja, where he teaches the locals to plant trees and love and respect the environment. The fireflies came out after dusk. We talked on as they danced around us.. I thrilled to learn of this visit to a determined farmer in the hinterland trying to train the locals on the importance of tree planting. How I wish I should have the opportunity to see this Nigerian who is interested in the national economic growth of the nation. We need to mention Rubens are worthy of praise and encouragement. Kudos to him, the environment needs trees. Thanks for posting this. Can I get Reuben's contact pls? I'm looking into this, thanks to Myne.